During the 1930s the Soviets were heavily engaged in the development of heavy tanks. With their own preoccupation came an assumption that the Germans would also be doing the same thing. This assumption and misinformation from the Germans and others sources led to the development of an anti-tank gun capable of taking out the thickest of armour. In 1940 the development of this gun was ordered. The prototype was developed as the 57mm F-31 antitank gun. The new gun was based on experimental 76.2mm F-24 regimental gun (later to become the Zis-3). Both gun shared the same breech, trail, shield and wheels, only the barrel distinguished the two guns. Even the basic carridge was the same, just the calibre changing for the shell. In October 1940 the first prototype F-31 rolled off the production line. The gun was tested and proved successful. In the beginning of 1941 the gun was renamed ZIS-2, after Factory #92s’ new honorary name ZIS (Zavod imeni Stalina ~ "Stalin’s factory"). 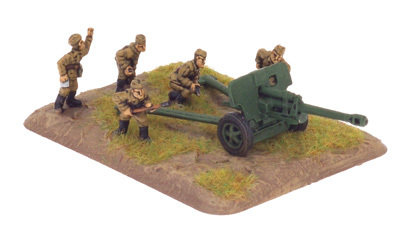 In the same year the ZIS-2 was put into service as "57mm antitank gun model 1941". In December 1941, production of ZIS-2 was cancelled. Some claim that such a powerful weapon wasn’t needed, while others argued the gun proved too expensive to manufacture, the real reason is unclear. In June 1943, the ZIS-2 was once more put into service, the appearance of monsters like the Tiger and the up-armouring of more common types like the Panzer III and IV called for the need for a high performance Anti-tank gun. 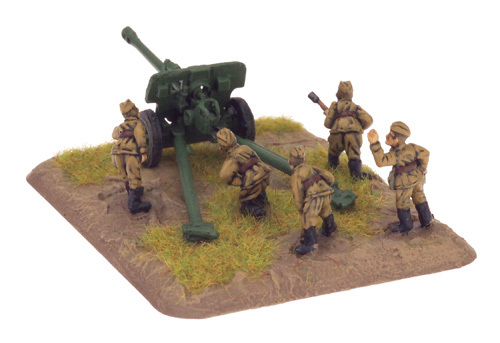 It was re-introduced as the "57mm antitank gun model 1943". 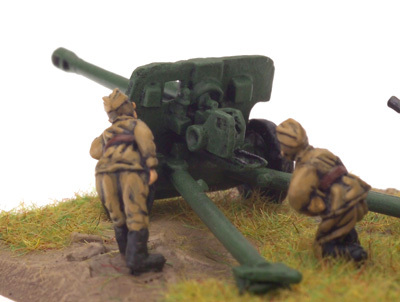 In 1941, in parallel with the ZIS-2, development of a new 76.2mm divisional gun was started. 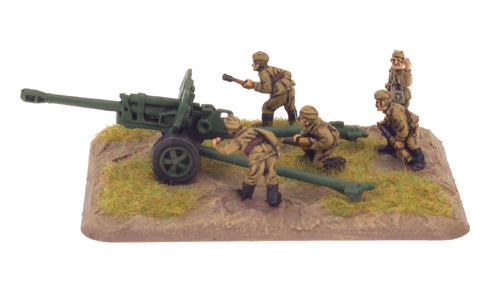 The gun consisted of a new barrel on the ZIS-2 gun carriage. As the gun carriage wasn’t designed for such a powerful artillery piece a muzzle brake was added to the ZIS-3 to reduce the recoil. The first prototype gun was finished in June 1941, and in July it went into trials which it successfully passed. 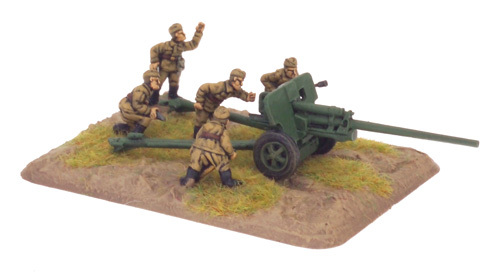 After only limited production in 1941 the ZIS-3 was finally put into mass production in February 1942, it was designated the “76mm Divisional Gun Model 1942." Both guns are extremely effective in their roles. 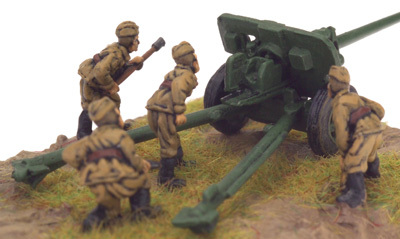 The ZIS-2 is the Soviets best anti-tank gun of the mid-war and wouldn’t really be surpassed in this specialist role until the introduction of the 100mm anti-tank gun in the late war. It has a Range of 32”/80cm, ROF 3, AT 11 and FP 4+. 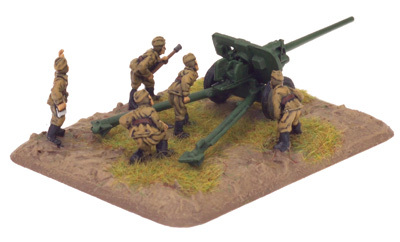 The ZIS-3 fits into its role as a multi-role support gun with ease. It also has an excellent range of 32”/80cm, ROF 2, AT 9 and FP 3+. 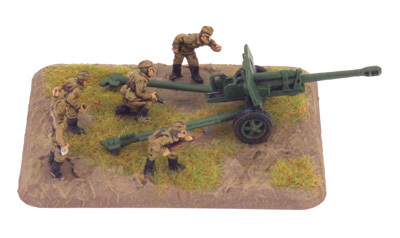 But it is also an artillery weapon with an Artillery AT 2, and a range of 96”/240cm, it has excellent coverage of the whole table. Inside the pack you get enough parts to make two guns, with barrels to make either the ZIS-2 or ZIS-3.